We're big fans of octaver pedals/envelopers on guitar and bass. There's something extremely funky about having the raw tone of a bass or guitar mixed with a synthy octaver sound and then running it through an envelope filter to make twisted synth-guitar/bass sounds. In Logic there are a few options for doing this so let's check them out - and if you're after more Logic ideas, check out the latest edition of Future Music magazine. Step 1. First off let's try the humble Logic Pitch Shifter II. We've loaded a Motown Electric Bass patch from the EXS24 bass sounds folder and played in a funky little line. We've then set up the pitch shifter on a buss so that we can dial in just the right amount of low octave vs dry sound. Simply set the pitch shifter's 'semitone' setting to -12 and mix to 100%. Choose the 'speech' setting for the most accurate timing. Step 2. To achieve a nice envelope-filtered octaver sound, pull up the Autofilter plug-in on the same buss as Pitch Shifter. Switch the buss send to pre fader and set the level of the dry electric bass sound. Set the threshold so the effect bites nicely onto the raw sound. Use a slowish attack, medium decay and fast sustain/release. Set cutoff to just under half and resonance to almost full, then 'fatness' to around halfway, with LP filter selected. Step 3. If you want to smooth out the sound a little more (envelope filters can sound a little choppy) then you can employ some compression on the buss too. You can get good results using Logic's standard compressor on the Platinum setting with a quick attack, low ratio and slowish release. Aim for around 3 to 6dB of gain reduction or whatever sounds right to you. Step 4. The next option is to try the Ring Shifter plug-in. This can be used for some very cool synthy tones, not just as a ring modulator. Set the plug-in to 'single' mode and move the main dial to a frequency of around -4Hz in 'exponential' mode. Set the envelope follower sensitivity to -5, attack to 0.44ms and the decay to 0.10ms. Also set feedback to 0.75 and the output to fully wet. This will give you a nice and juicy synth bass/guitar sound. Step 5. Once again, to smooth out any huge peaks, pull up a compressor and use roughly the same settings as in Step 3. However, as the Ring Shifter has quite a wide frequency spectrum, you'll likely need to set a higher ratio (around 3.1:1 should work) aiming for a peak reduction of between 8-12dB. Step 6. 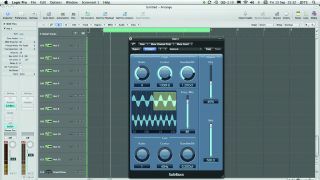 The final option is to use the Logic SubBass plug-in. Set the high and low ratio to 2, the high and low centre frequency to 120Hz and the high and low bandwidth to 0.43Oct. Then set the freq mix slider to 100, the dry output to approx 50% and the wet output to full. For guitars, ignore the low section completely and dial in a ratio of 4, a centre frequency of 1300Hz, a freq mix of 85 and a bandwidth of 1.20Oct.